Kindly check your PAN Card application status online from the following websites by acknowledgement number (if you applied through NSDL) or a coupon number (if you applied through UTI). 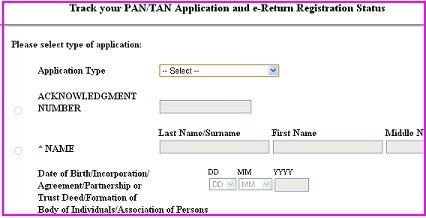 Check pan card status by name and date of birth, SMS, by Call, and PAN number or application reference no. Applied through NSDL and having Acknowledgement number, Kinldy visit below given nsdl website link to check. Applied with UTIITSL and having Coupon Number, Kinldy visit below given UTI website link to check. The UTI site changed this link(http://www.myutiitsl.com/PAN_ONLINE/trackApp) to This website link to http://www.trackpan.utiitsl.com/PANONLINE/trackApp, track your PAN application status, Please use this link for going forward. Applied with Applypanonline.com and having Coupon Number, Kinldy visit below given Applypanonline.com PAN website link to check. Applied with thepancard.com and having Coupon Number, Kinldy visit below given Samanta PAN website link to check.